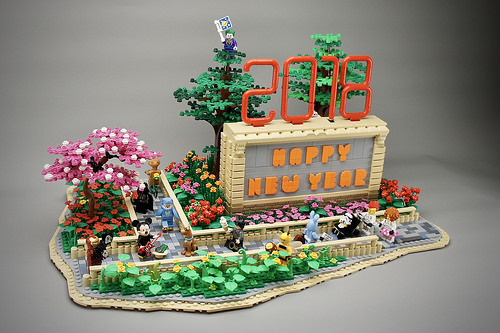 2018 has officially arrived worldwide, and this lovely monument by Pasq67 is here to help us celebrate. While we’ve seen the great technique of using 1×1 quarter circle tiles for lettering before, we hadn’t seen this super cool font made of macaroni pieces. And no matter what your favorite theme is, you’re covered here as a multitude of characters stroll through the park.